The Illinois PGA elects its president every two years, and the most recent changing of the guard on Nov. 19 was much different than all the previous ones. When Jim Miller took over the reins from Mark Labiak the section gained an unusual new leader. Rarely has the Illinois PGA had a president from a club outside of the Chicago area. Miller is in his 14th season as head professional at Bloomington Country Club, which is located in central Illinois. And that’s not all. Miller is also continuing a family tradition. His father Hal was the Illinois PGA president from 1982-83, when he was in the midst of a long and successful run at Evanston Golf Club in Skokie. The Miller & Miller scenario begins at Evanston, where Hal entered the golf business as a caddie. He later worked there on the practice range and as a starter before becoming an assistant professional under the legendary player and teacher Johnny Revolta in 1960. Hal spent seven seasons as a Revolta assistant, then became the head professional in 1966 following Revolta’s retirement. Hal was the head man there for 35 years before retiring on Dec. 31, 2001. Now 82, he’s an honorary member of the club that he served in one capacity or another for about 50 years. Selected into the Illinois Golf Hall of Fame in 2007, he also remains involved with the Illinois PGA as a regular rules official at its tournaments. A Glenview resident, Hal and wife Kathleen are the parents of five children, all of whom worked at Evanston in one capacity or another while growing up. Jim is the only one who followed Hal into the golf industry. Jim, 52, graduated from the University of New Mexico in 1990, then spent three years as an assistant at Sunset Ridge Country Club, in Northfield, and another at Indian Hill Club, in Winnetka, before Hal had an opening on his staff at Evanston. Jim eventually succeeded Hal as the club’s head professional and held that job for five years. Jim did. When an opening developed at Bloomington he applied, was hired and has found a good job fit. Their four children are Parker, now 21; Katie, now 19; Ashley, now 17; and Bailey, now 14. 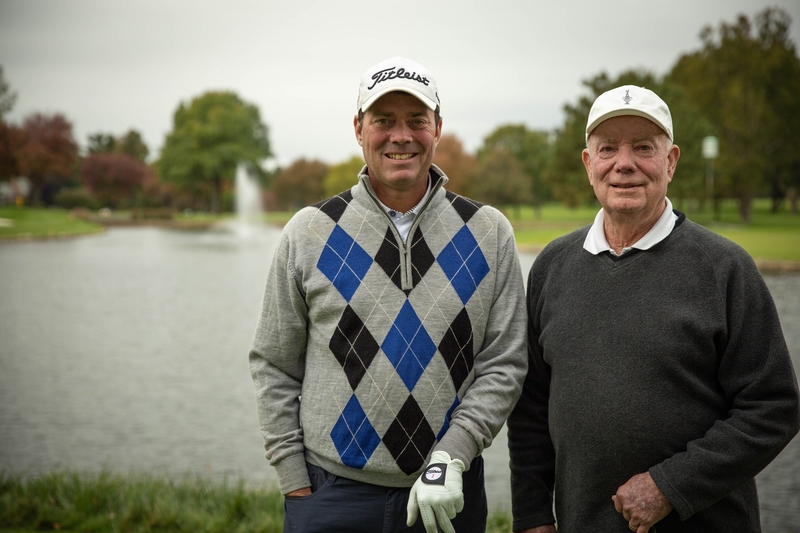 Bloomington, which has 330 golf members, was agreeable to Jim’s need for more family time. A good enough player to qualify for two national PGA Professional Championships and become the runner-up in the 1995 Illinois PGA Match Play Championship, Miller is focused on a broader range of duties now. State Women’s Amateur five times. Miller inadvertently played a role in hurting Bloomington’s chances to bring an Illinois Open back downstate. He was the Illinois PGA’s Opens Committee chairman when the decision was made to alter the format of the event in hopes of expanding the field and increasing the entries. The Glen Club, in Glenview, became the permanent site for the finals and a nearby club was needed as the alternate site each year. Bloomington was too far away to fit the bill, but Miller is happy with the format change made in the section’s premier event. An Illinois PGA board member for three years while at Evanston, Miller dropped off the board when he made the move to Bloomington but he ran and was re-elected in 2009 and was elected an officer in 2015, when he ran for the secretary’s position. That started his progression to the presidency. He was secretary in 2015-16 and vice president in 2017-18. Now he takes on the responsibility of leading an organization with about 800 members. The Illinois PGA presidency is much different than when his father was in charge. The Illinois PGA had an executive director (Ken Boyce) at that time but no long-term headquarters and only two assistants for Boyce. Now executive director Carrie Williams heads a staff that has at least three times that number when summer interns are factored in and a long-term home base at The Glen Club. Diversity and inclusion is a top business initiative of the Illinois PGA Board and the goal is to meet or exceed the national standard. But that’s not his only chore, of course.